Kids love foods that are fun to eat. This recipe for sausage calzones certainly fits the bill. If you unfamiliar with calzones, they are a half moon shaped baked sandwich which has the filling or toppings on the inside. They can be picked up and eaten with your fingers and they are served with a fun dipping sauce. 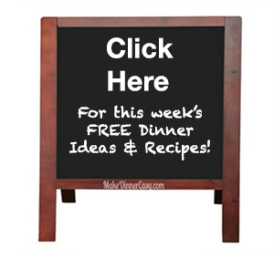 While you can certainly make your own dough, most people I know want something a little easier. I've experimented with using everything from frozen bread dough to pizza dough. The easiest solution, I found was to use refrigerated biscuit dough that comes in a tube. The dough is already formed in a circle and stays in that shape when it is rolled out, making the finished product attractive. Although this recipe calls for sausage, you can use any filling. 1. On a floured surface, roll out 1 biscuit until it is a circle, 5-6" in diameter. 2 Dip your fingers in a bowl of water a slightly wet the perimeter of the circle. 4. 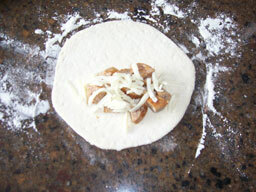 Fold the top half of the circle over the sausage and cheese5. Use a fork to press the outside edges down, leaving fork tine marks around the edges. 6. 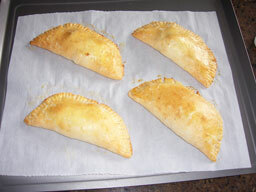 Place the calzone on a parchment paper lined cookie sheet. Repeat steps 1-6 until 8 calzones are made. 7. Brush the beaten egg over the top of each calzone. 8. Bake at 350°F for 12-15 minutes or until lightly browned. 9. Meanwhile, heat the spaghetti sauce. 10. Serve with heated sauce.